Welcome to the Town of Clam Falls! Clam Falls Township has two unincorporated villages — Clam Falls and Lewis. The majority of the residents work outside of the township. The township is over 50% forested. Agriculture assumes fewer than 30% of the land base. Native Americans lived here long before non-Native Americans arrived in the Clam Falls area. They named the river Kenesca – Seba or Clam Shell River and the falls were called Cobbekonta or Little Falls. Loggers gave it its present name of the Clam River. W.H.C.H. Folsom of Taylors Falls was the first ndn-Native American to see the fall in 1847. Somers Lake is the only lake in the township. Wood and Clam Rivers, along with Somers, McKenzie and Knapp Creeks, make up other water flows. Clam Falls Flowage, Knapp Flowage and Godfrey Flowage all provide great fishing. Wild game has always been abundant and fishing is good. Today the McKenzie Creek area is public land. Logging was started north and south of Clam Falls township in the mid 1840’s, and at that time the first road was built through the area. Out crops of trap rock can be found throughout the area. In 1857 copper and silver mining were tried and that same year the first settlement in the township was started. The first survey map of Clam Falls was completed in 1853 and showed a logging camp near the falls. A railroad was planned to come through the Clam River Falls are in 1857, but was not built due to financial problems. Daniel F. Smith became a very important figure in Clam Falls. He helped build the first dam at the falls in 1859 and a bridge over the Clam River at the falls in 1864. In 1868 Mr. Smith improved the Butternut Road built in 1857 from Clam Falls to Luck and at that time the road name was changed to the “Clam Falls Road”. In 1875 it became a state road and was one of the most used roads in the county. He is credited as being the first settler of Clam Falls and building a saw mill and starting a post office in 1871. Smith had the Clam Falls area platted in 1872 and the village was started. Sometime later the settlement of Knappville was started in the northwest corner of the township on the road from West Sweden to Clam Falls. 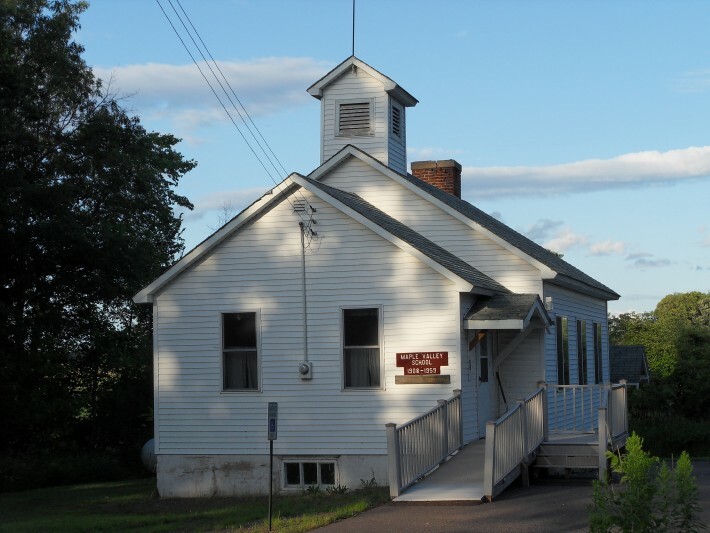 Education was important to the settlers and the first school was built in 1873 in the new village of Clam Falls. It was called School District No. 3 of Luck Township. Clam Falls was part of Luck Township at that time. The first school board members in 1873 were Page Butts, J.C. Perry, and Ezra Jewell. Other schools built in the township were Knapp and Fischer Schools in 1880, Poplar Ridge in 1900, Maple Valley in 1908, Almquist in 1911, and Lewis in 1921. The Clam Falls township schools have all consolidated with the Frederic School District. Logging started to be a big industry in the Clam Falls area around 1873, when a large camp was built to the south and soon after several others were built. Most of the logging was of the pines and the river and creek were used to transport the logs. In the late 1890’s hardwood harvest started in the Maple Valley area and a major log road was built to a new steam operated saw mill in the village of Clam Falls. Major logging operations and river drives ended around 1940 in the Clam Falls area. 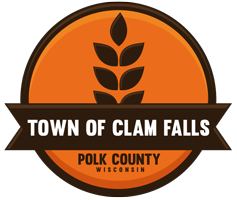 On November 14, 1876, the Polk County Board detached township 37 range 16 from the town of Luck and named it Clam Falls. The first town meeting was held in April 1877 at the home of William Knowles, at which time Dan Smith was elected chairman. Others elected positions included John Almquist and John Bjornson, supervisors, Peter Wetherby, clerk, and Ezra Jewell, treasurer. Early town meetings were held in homes and later in the Clam Falls Village Hall and then in the Lewis hall. At the present time meetings are held in the Maple Valley School, the current town hall. Clam Falls had roads as early as the mid 1840’s. The first record of the township building a road was in 1879. At that time the township had a tax of $150.00 and a seven mill tax for roads. In 1886 the Lundeens built a grist mill on Knapp Creek. A forest fire swept through the area in 1891 which burned down the village of Clam Falls. It was platted again in 1892 on the east side of the Clam River and grew to be a large town, which included a hospital. During this time baseball came to the town and lasted for many years. Daniel Smith was the first farmer in 1871. Farming started to grow as more land was being cleared off from logging. A co-op creamery and cheese factory were started in the village for a place for farmers to sell their milk. As time moved on agriculture became the major industry in the township. A creamery to serve the township was built in Lewis and a cheese factory started in the Rocky Ridge area. A few larger dairy farms still operate in the township, but all the milk is shipped outside the area. Religion was an important part of the lives of the settlers, and in 1902 the Catholic congregation built the first church building in Clam Falls Township. In 1907 the Lutherans built the second church building. In 1914 Charles Lewis built the third church building in the township of Lewis. The Methodists (1914) and the Nazarenes (1922) opened churches in the village of Clam Falls. Charles E. Lewis arrived in the township in 1900 and built his mansion on Knapp Creek and called it Seven Pines. In 1909 a fish hatchery was built and later a large dairy farm was added. After the railroad came through in 1912 Mr. Lewis had some land surveyed next to Knappville on the east side. He helped build the village and named it Lewis. The village of Lewis grew to become a full service town. A baseball team was organized in 1918 and lasted for many years. In 1914 a hydro-electric plant was built at the Clam River falls and a power line built to Frederic. Today all the electricity comes from outside of the township. President Coolidge visited the area in 1928 and fished at Seven Pines. The fish hatchery and private fishing are still in operation. The McKenzie Creek and some of the Clam River are still being developed for public lands. With the development more people have started to look at Clam Falls Township as a recreational destination and a good place to live and raise a family. In 1900 Clam Falls had a Knappville within its borders. Capt. Oscar Knapp, an early settler and steam boat builder at Osceola, bought 680 acres by Knapp Creek. It was covered with timber and a stream with natural springs of water. Speckled trout were abundant. Mr. Knapp constructed fish ponds and a spawning house. There were rich deposits of marl along the stream, but people in those days did not know the value of marl. Knappville later became Lewis. The western part of Clam Falls Township, which is now called the Lewis area, was settled in the early 1870’s. A road was cut through the area from West Sweden in 1871 to the Clam Falls Road. John Almquist, who settled in the Lewis area, was elected to the first Clam Falls Township Board in 1876. Capt. Oscar Knapp was another early settler, who owned 680 acres along the Knapp Creek, which was named after him. A small settlement started up in the 1880’s along the road from West Sweden in the northwest part of Clam Falls Township. This settlement was known as Knappville. It served travelers, area settlers, and lumber jacks. The Lundeen brothers built a grist mill in the Lewis area. Charles Lewis came to the township from the Twin Cities in 1900. He was a wheat broker and wanted a place in the country. The Knapp holding met his needs, so he purchased it and built a very nice home on the land in 1903. He built the house near a grove of seven pine trees. Being a nature lover he named his new place Seven Pines. The house is now on the National Register of Historic Places. Charles Lewis built a fish hatchery in 1909 and started the village of Lewis in 1912 after the railroad had been built through the area. The village of Lewis and the area around it grew and became a very vibrant part of the area.